August is anniversary month for the Emerald Isle Parrothead Club (14th this year! ), and that means it’s time for the annual Island/Sandbar Party to thank all of our members and volunteers for their participation and good works during the last year. The party will be held on Sunday, August 7th from 1PM to 5PM. The location of the event is Pelican Island, which is just off the shoreline of Historic Swansboro and opposite the Swansboro Yacht Club. 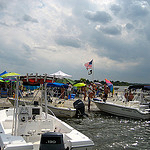 You’ll know you’ve found the right spot when you see the dock, American Flag and Parrothead Crazies. Hamburgers, Hotdogs, condiments, and paper products will by provided by EIPC as a thank you to our members. Please bring a side dish or dessert to share and of course your own beverage of choice. Music will be provided by Parrot Head favorites 4EverAll. Organizers will have planned several fun activities and games to get some competion going, but feel free to bring along any beach games to share with the group. This is a private party for Parrot Heads and their guests. We will not have a membership table at the event, but if you’re not a current member, just go to the website and sign up online. This would be a great first event to attend and meet the members! Pick up points: – 1. Swansboro public dock between Bake, Bottle & Brew and Saltwater Grill. 2. Dock at Bake, Bottle&Brew (Jack, the owner of the establishment and part owner of Pelican Island has offered his dock and people can enter through store).